The purpose of education is to make itself self-sustaining. To make it so valued and its exposition so crafted that each generation will yearn for more – for themselves, for their fellow citizens. And, most vitally, for their children. It is about reducing ignorance to a stump; levering up choice and flexibility of personal option; and filling the soul with occasions of pure pleasure at making connections and discovering insights that recast the moment, a life, – of existence. And then, channeling an urgency to pass it on. I teach in a school with one of the most varied of social spectrum you will find. From the children of farmer millionaires to some of the most deprived families in Yorkshire. People move here from east Hull because there is cheaper accommodation, for goodness sake. But in over two decades of teaching at the school you soon realise the single most important factor in student achievement. It’s not based on affluence, or whether the child is FSM, or from a single-parent family. It’s not based on KS2 TAs or CAT scores. It sighs through each parents’ evening we hold. These occasions are the ones I feel most proud of my school: a hall full of parents whose DNA you suddenly see cavorting within that familiar student’s face; the guardians who have a measured, sober presence as they absorb your report on the child they have chosen to look after; the grandma, or sister, or occasionally, brother – who has taken on the role of bringing up this intensely-listening student on the seat beside them. We are the team. A collective. The pincer-movement of care between waking up, coming to school, returning home and going to bed of each of these children. I love these occasions. I love these people. I get intensely proud of the purpose we’re engaged in, together. And, if you’re lucky enough to teach in the same place for long enough, you see a student return years later as a parent and laugh in that easy – but not easy – familiarity of a returning tutee. All grown up and with your own children now passing through. But not quite able to flip away from how you were at your last meeting in a classroom saying farewells before the first of the exam trial. These are the ones who will pass on the code. It’s the ones who stayed away. The names on the appointment list that remain unticked. The tired raise of the eyebrow with a colleague at the student whose parents you really needed to see, but who – again – failed to attend. This, is the purpose of education. To reduce this negative equity in seeing any point in education to a level where it ceases to be passed on to the next generation. The biggest differentiator of those students that we can work with to establish their talents and supercharge their progress, is the attitude of their parent(s) or carer to education. If it’s deficient, then the sharpest intervention in the world will find it hard to gain traction. The students with the most significant need are the ones growing up in a household that sees little point in the whole business. So that has to be our purpose. Not to let it transmit itself to another generation. To bind each student to an experience of teachers, support staff, pastoral care and good guidance such that they, in their turn, will look at their own children and say ‘School is important; your education is important, and I got so much from it that I want you to get the same, if not more’. How we break that cycle doesn’t lend itself to quick fixes. But it’s what should drive our purpose with each student. To give them the best lessons we can. To acknowledge them as an individual worthy of time, patience, care and numberless forgiven re-starts. Never giving up, never losing hope, and realising that their education doesn’t finish at 16 or 18 (- despite the seeming intransigence of tables, grades, scores-on-the-doors), but will be a lifelong continuum that we are only nurturing (if we do it right). 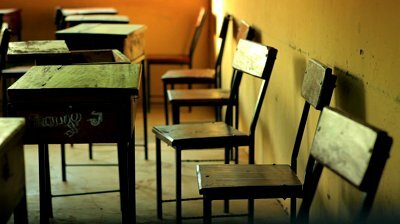 The blight of education is the empty chair at parents’ evening. The purpose is filling it. We have lost with some of the present generation of parents. The aim must be to make sure we win with the next generation. They’re the ones sitting in front of us on Monday morning. Thank you for talking so eloquently about the the challenges we face in schools where parents do not value education. Our mission is to break that cycle, however difficult that may be. It’s not easy is it? But unless we aim to tackle it, teaching becomes a sisyphean challenge with each new intake. Here’s hoping. Many thanks for reading & commenting Ann. My best moment at a parents’ evening last year was when a parent said to me, “Teachers now, you’re so much better than they were twenty years ago. I left school at 15, but if I’d had teachers like you I would have stayed.”. This was particularly poignant as I had just told him that his son is one of 29 students in the year group who should be aiming at Oxford or Cambridge or other top universities. I asked the parent where he had studied at university, making the assumption as his son is so brilliant. Indeed, this man is just as bright as his son, and is a successful manager in a comms company, but twenty years ago his teachers did not inspire him to continue his education. We do now Andy, and thanks for your super post reminding us that there are still some parents and children we are struggling to reach. Brought a lump to my throat . . .
I’ll say ‘thank you’. But maybe it should be ‘sorry’ ?? 🙂 Appreciate you taking the time to add your reaction. A highly-quotable, impassioned, and inspiring piece of writing. Perfect Monday-morning-commute-to-school reading. Thank you! Many thanks for reading and taking the time to comment Kyle. Appreciate your reaction. A beautiful piece of writing and an inspiring rationale for what we’re doing – thank you for this Andy. Good of you to comment Harry. Thank you. Thank you so much Natalie. Especially appreciate receiving a response like that from someone who is not directly involved in schools every day. We need reminding now and again what a privileged job we have doing it daily. Carry on enjoying your chances to be part of it. Thanks. Loved this blog, Andy – beautifully written and spot on in its message. I taught for 30 years across 6 different schools and became increasingly convinced that what made the difference to students’ life chances was parental support and engagement. Where schools and parents are fully invested in the success and happiness of the child at the centre of the relationship you can achieve so much. Where parents are disaffected and uninterested, or openly hostile to education/any kind of authority, it’s so much tougher to help the child be the best they can be. Thank you Jill. Good to get this kind of emphatic confirmation from someone with so much experience. We discussed this very matter after school tonight as the second dual challenge to channel our efforts into, alongside high quality teaching inside the building. Appreciate your reaction & comments.